JUST ADDED: How do you respond to a gatekeeper who says the following: "What is this call regarding?" I've tried a variety of opening lines in my day, but the most effective and results oriented way to respond to this sales objection is the following: "I'm trying to set up an office visit to see (Insert the first name of your prospect here) during the week of (Insert a date here)." At this point a few things will happen. First, the gatekeeper may just transfer you to your prospect. Secondly, the gatekeeper may ask for additional information from you (i.e. the reason why you want to meet with them) and then put you on hold and check with their boss (your prospect) to see if they are interested. Or finally, the receptionist may just respond: "We have no interest." And if you hear this specific response then you need to run with the wind because your prospect has already pre-wired this response in the mind of the gatekeeper and to continue any further is just a waste of your time. It's really a complete waste of time to leave a message with your prospect's gatekeeper. Actually, you might as well spend time cleaning the lint off your clothes for better use of your time. If you really want to leave a message with your prospect's gatekeeper then try the following: "This is (Insert your full name here) with (Insert the name of your company here) in the (Insert the name of your division name here) and we'd like to set up a visit during the week of (Insert a day here)? We were wondering if (Insert a day, date and time here) is a good time or perhaps (Insert a day, date and time here) works better for (Insert the first name of your prospect here)?" 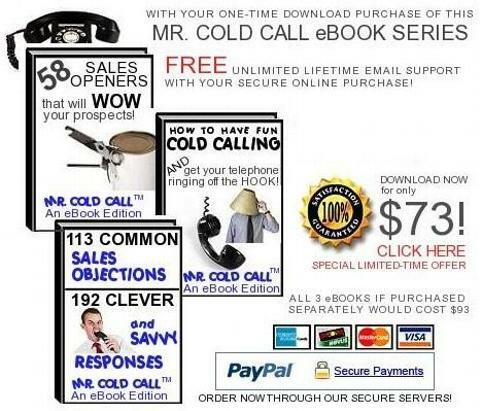 This strategy is much more effective than just leaving your name because now you have set the tone for the call and your prospect will feel more obligated to call you back. Tired of being transferred to the assistant's voicemail rather than your prospect's voicemail? First, find the name of another executive at the company you are prospecting (i.e. Do a Google search or looking on the company's website under "Managment Team" or "About Us"). Secondly, call the main corporate number and ask to speak with this executive. The receptionist will probably transfer you to their assistant. Thirdly, once you get this assistant on the telephone you politely ask them to transfer you directly to your prospect (Use their first name rather than their full name. By doing this, it gives the impression that you know this person versus someone trying to sell them something). This technique works for many reasons, but one of them is the fact that assistant's are trying to protect their boss's time and not that of another executive. Many times these assistants are so flooded with work that they just want to get you off the phone. The previous tip can also be used to get a prospect's email as well. Once you get to the third step above you simply say, "(First name of prospect), I was wondering if you could help me for a minute, I'm trying to email (Name of your prospect) and I just want to make sure that I took it down correctly? Here's what I have (Insert here the email address), does that sound correct to you? If the assistant says that your prospect has no voicemail then there's probably a reason why they don't have voicemail. I would suggest not leaving a message (If the assistant is telling you that (he or she) doesn't have voicemail can you imagine how many other sales reps are calling in and leaving a mesage with the assistant?) and say the following: "Actually, my message might be a bit too long, if you wouldn't mind, may I get (first name of prospect) email?" If the assistant insists that their boss (your prospect) is not interested then try saying, "Can you put me on hold for a sec and ask (first name of prospect) if I can bring breakfast tomorrow for your entire office? Maybe, I could at least drop off some information and speak with (him or her) for no more than five minutes? If the assistant is a woman then send flowers (If the assistant is a male then go to Sharper Image and pick up a small ticket gift item) with a note saying, "I hope that I brightened your day, when I call (first name of your prospect) tomorrow maybe you can let me through so that I can speak with (him or her) about (Insert what your goal of the telephone call will be or the reason why you want to speak with he or she)." Never ask the assistant if your prospect has "voicemail" because that will signal that you really don't know their boss. It's better to say, "I'll go ahead and take (First name of prospect) voicemail, thank you!" Did you know that their are 15 types of screeners? Click here to read about each type and how to handle them! After you state your name and the reason for your call ask the assistant, "Who do I have the pleasure to speak with today?" Once you have the name of the assistant make sure that you record their name in your sales notes. This way you make them feel important the next time that you call. Most sales reps know the name of their sales prospect, but don't even know the assistant's name! Send a thank you note (preferred way) or an email to the assistant to thank them for their time! If you had a positive experience with the assistant let your prospect know! You can do this by email or when you leave a voicemail message for them. If you've been trying to reach your sales prospect for many months and the assistant offers to take another message then you could say, "I've been trying to reach (First name of prospect) for about (Length of time) and I hope that both of you admire my persistence, I really don't know any other way." (smile and then pause) The assistant will forward your message out of pure symphathy for you and the odds that you will get a call back will increase by the power of ten, how's that sound? Always be positive on the phone and make sure that you convey this positive energy over the phone. Many sales reps sound very boring on the telephone so your enthusiasm is a blessing for any assistant that takes your call! If you want to make sure that the assistant even took your message ask them to repeat your phone number. 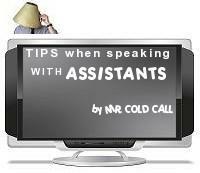 Check out this article to find out how to respond when the assistant says, "What is this call regarding?" The assistant won't give you a contact a contact name? Read this article to learn 6 ways to locate the name of a business prospect! If the assistant is mean it's important that you do not take their action's personally. You're better off just pausing and then moving on. Don't let this negative experience taint your next call just keep thinking positive! Those who have apositive attitude will always control their space!